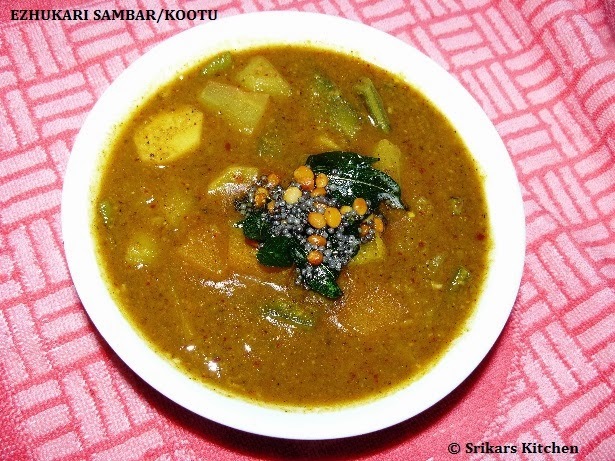 This ezhukari kootu basically means seven kinda vegetables are used in the Kootu & so it got its name. Mainly made during the time of tamil month Margazhi when thiruvadharai natchatram is born where in abishegams are done for Lord shiva & Pongal festival.Both the thiruvatharai Kali & ezhukari kootu are very auspicious for Lord shiva during that time. Dry roast all ingredients & grind a fine paste with water. Boil all the vegetables in tamarind juice with salt. Cook all the vegetables until almost done, add the ground paste. Add cooked tuvar dhal & mix well. Heat oil in a pan, add miustardseed,channa dhal,fenureek seed & allow to temper, add to kootu. Wat a fabulous kootu, makes me hungry.. Sri!! ezhu kari kootu looks perfect n u hv done in our traditional way of cooking dear... looks delicious n yummy dear..
You have used alovely slection of veggies ti make this wholesome dish. one of my favourite dish looks perfect!! Nice koottu... perfect with rice. I think this can be eaten any time of the year, maybe in spring it would be better with all the produce in the market. I love this kottu anytime. In fact I am going to gather some veggies this week to prepare it. Thanks for reminding me.